Field labs are at the heart of the Duchy Originals Future Farming Programme. Farmers and growers test new approaches, share existing best practice and sharpen their problem-solving skills. The field labs are on-farm events, open to all - organic and otherwise. This field lab hosted by the award-winning Pollybell Organic Farm is seeking to address the potential benefits for vegetable production of “plant strengtheners”; products which are based on sea water. These products are becoming widely used in the USA and in other EU countries to some acclaim and this is an opportunity to compare three such products under UK field conditions for field vegetable production. Trials have been carried out in Europe, although results are not yet published online. The products to be trialled have been verified for use in organic production in the UK. A number of products based on naturally occurring substances are beginning to appear on the UK market claiming to be able to reduce the requirements for inputs for plant growth. 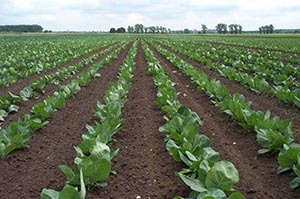 In trials carried out by independent agronomists with some of these products in Europe similar yields of vegetables have been produced with significantly lower fertiliser inputs. As such it is possible that under organic systems application of these “plant strengtheners” could result in enhanced yields for arable and vegetable crops. This field lab will identify the potential impact of the products and seek to identify their mode of action and potential benefits for the UK growing sector. We also aim to validate the manufacturer’s claims that the products stimulate enhanced uptake of nutrients via plant roots. This is meeting 1 of a series.